Rage Form is a Formchange in Kingdom Hearts III. It has a chance to activate when Sora reaches critical health, regardless of current Keyblade. During Sora's final fight against Xehanort in Scala ad Caelum, Xehanort uses the power of Kingdom Hearts to absorb Sora's light, forcing him into Rage Form. By attacking Xehanort, Sora is able to regain his light. 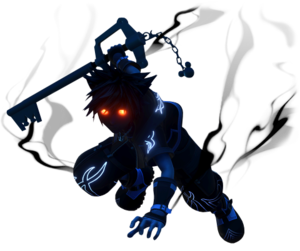 Rage Form turns Sora's clothes, skin, and Keyblade deep black, with glowing red eyes, an aura of darkness, and a fluorescent white swirling pattern on his pants. It is similar to AntiForm and envelops Sora's Keyblade in darkness for quick and powerful attacks. Unlike AntiForm that represents Sora's darkness in his heart, Rage Form is when Sora is in a rampage state, fueled by anger. When in Rage Form, Sora can use Riskcharge as a situation command, raising his Strength, at the cost of depleting half his remaining health. After using Riskcharge three times, Sora gains access to Rage Form's finish command. Entering Rage Form replenishes Sora's HP so it is useful when in low health. ↑ Dengeki Playstation Interview; Interviewer: "There's a form that appears called "Rage Form," which reminds us of the "Anti Form" from KH2. What is the setup behind that?" / Tetsuya Nomura: "The forms in this title are very different from that of KH2, so we decided to change all the names. Rage does indeed have characteristics that are reminiscent of Anti, but it's basically a separate thing setup wise. Anti is based on Sora getting completely stained in darkness, but Rage doesn't go quite that far. It's based on him going into a rampage state, controlled by feelings of anger." Translation by goldpanner. This page was last edited on 1 March 2019, at 18:10.